Welcome Emma’s newborn girl photography session to the blog! 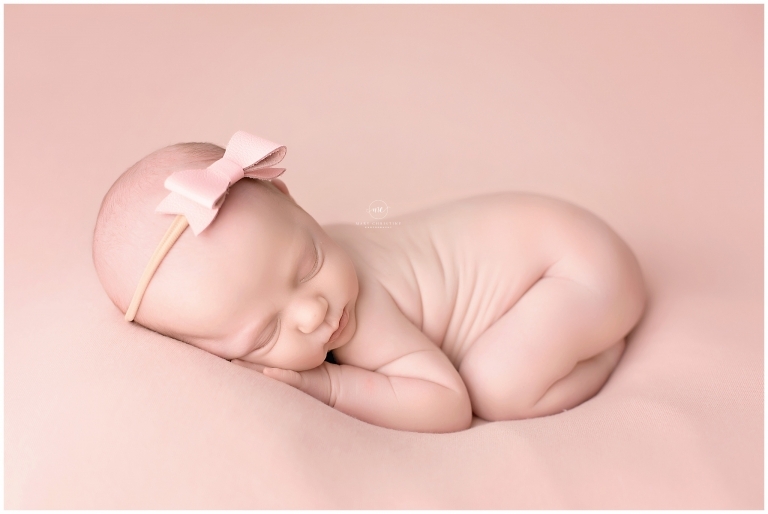 This dainty little lady was amazing for her newborn session! And of course we did all things girly! How can you not with a sweet little face like this? 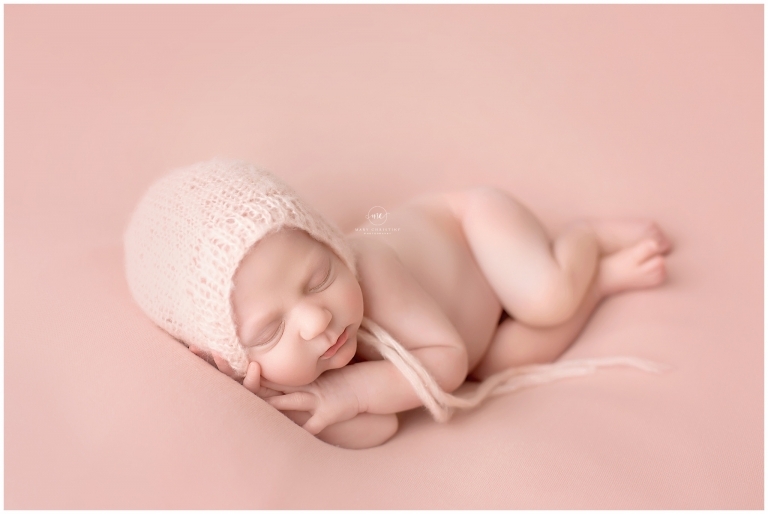 Light pink is a client favorite for newborn girl photography. After all, they don’t call it powdered pink for a reason, right? This bow from Hello Miss Gorgeous is the perfect final touch. Oh be still my momma heart. You guys, older siblings are so important to get in on the photos. I would say that is one smitten big brother, wouldn’t you? There was one photo that was very important to me when my girls were little, and this was it! There is something about the glow of a new momma with a baby in her arms. So tranquil and beautiful. And how tiny they look in Daddy’s hands! It really puts into perspective just how small they are those first few weeks! 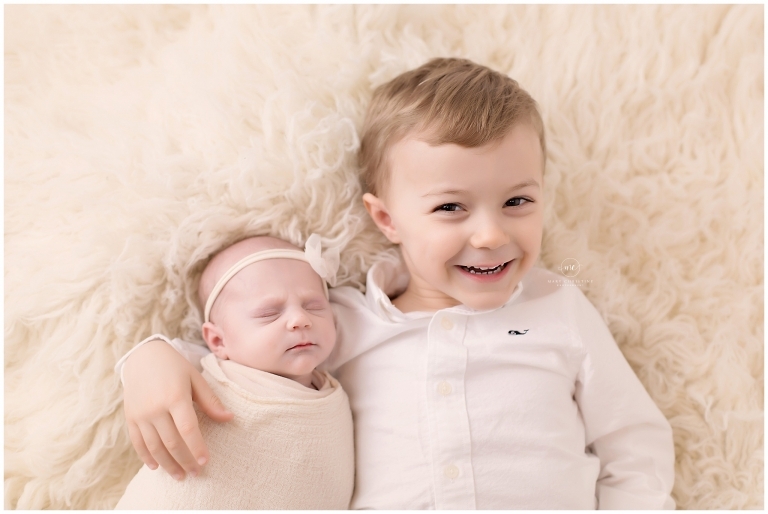 Grey is one of my favorite neutrals, even for newborn girl photography! Add a Baby Bliss floral crown, and boom! It’s perfection! Now I have to admit, this is probably my favorite image taken this year. So far anyway. I LOVE florals, even if it’s just a little touch. It’s dainty and add the perfect texture without taking away from Emma’s face. Both these knit sets in the images above and below are from Beautiful Ewe. Her knits are soft and gorgeous, she never disappoints! The colors are absolutely my favorite as well, so soft and sweet. Thank you so much for stopping by to view Emma’s newborn girl photography session! If you are interested in seeing more of my work, please visit Layla’s newborn session on the blog. Currently, I am booking newborn sessions into the summer months. Welcome Kirsten’s maternity photoshoot to the blog! My goodness, what a stunning momma! Pregnancy really is an amazing, beautiful thing, isn’t it? With Northeast Ohio deep in the throngs of winter, outdoor maternity sessions are nearly impossible this time of year! That should not mean that we avoid them though! It is so important to document your pregnancy, it is something that I regret more than anything. Studio maternity photoshoots are just as fun and beautiful. I love the simplicity of these sessions. It is all about the details. Silhouettes are definitely a go to in the Mary Christine Photography studio! And who doesn’t love this classic? There is a little human life growing in that bump, y’all! It never ceases to amaze and thrill me. Another studio favorite? Dreamy backlighting. Doesn’t momma look angelic? I love a good bump shot. After all, it makes sense, I miss my own images like these! Did you know that all gowns and under garments are provided for you maternity photoshoot? It’s true! All you have to do is your hair and make up and we provide the rest! Playing dress up is half the fun, right? This gown from Sew Trendy is a client favorite. I always encourage spouses and children (if you have one already!) to participate in the maternity session. After all, it is a special time for everyone! This will likely be their last image together before their little girl makes her big appearance. We can always get a little creative and have some fun in studio too! Ladies, it’s time that we reframe our approach of studio maternity sessions. These are just as gorgeous and timeless as the outside sessions. Although, I do have to admit, I am looking forward to spring too. Thank you so much for stopping by the blog! Are you expecting and considering a maternity photoshoot? Please check out similar posts on the blog. Welcome Baby Zane’s newborn photo shoot to the blog! It has been a bit quite here on the blog, that tends to happen when the studio gets busy. Not to worry, there is plenty of baby goodness heading this way soon! Let’s kick off with Zane’s newborn session! 2019 seems to be the year of little girls so far! As fun as girls are, it was a blast pulling out all things boy for Zane’s newborn photo shoot. Blue, grey, and neutrals…I am in heaven! Not to mention a handsome little man to snuggle on a cold day. Sign me up! This drop from Freebird Prop Shoppe is the perfect blend of grey and blue. Oh that sweet little face! Couldn’t you just eat him up?? Like most babies, Zane loved being swaddled up and cozy during his newborn session. This potato sack pose is such an easy go to for babies who love to be held! It keeps them cozy and happy, I would call that an overall win! This silhouette is my most requested family pose. I love how all the little details are highlighted! So simple and timeless. It has been awhile since we pulled out the moon prop that my awesome husband made for me years ago. I am so glad momma requested it, I forgot how much I love it! Of course no newborn photo shoot is complete without a baby in a bucket. Can I get an amen? Always a favorite! Aren’t they the most beautiful family? They are also the sweetest, it was amazing getting to know them! Thank you so much for stopping by the blog! Are you expecting soon and considering a newborn photo shoot for your little one? Please check out the What to Expect page to learn more about these sessions. Welcome Miss Jemma Jane earth side! This sweetheart stole my heart, I could have kept her all day! Such a gorgeous little girl with such sweet parents, I love meeting new families being a Brunswick Ohio newborn photographer! For Jemma’s newborn session, her momma requested florals, pinks, and creams. Right up my alley! It was the perfect for such a dainty little lady too! How sweet is Miss Jemma in the potato sack pose? Babies love being cozy and swaddled, this set almost never fails us for the little ones! Catching a newborn smile is all about timing. Jemma was dozing off into a deep sleep when I snapped this one. Maybe she’s dreaming about milk? So sweet! Florals are always a perfect timeless, girly touch in my opinion. It adds a touch of texture to a simple image. My favorite! Ah, a silhouette of love right here. I love how the light draws attention to all the little details in this family pose. I wish I had a photo like this of my own girls as babies. Those toes!! Well, it is no secret how much I love babies in buckets, but layering props is another favorite of mine. How neat is this bucket and riser from Libelle Props? Organic and timeless are my jam. Ah, I love a cozy family photo. This one melts my heart. I hope Jemma’s parents love and treasure these photos! Ten teeny tiny perfect toes! It doesn’t get much better than this does it? Thank you so much for stopping by the blog! 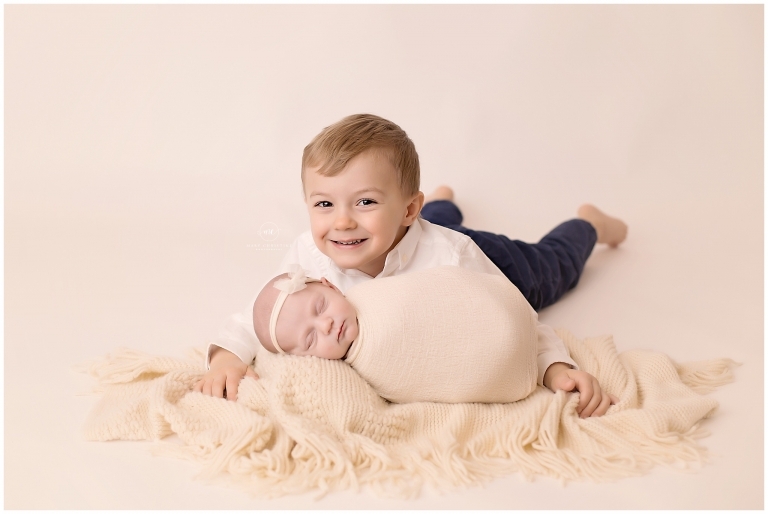 Are you looking for a Brunswick Ohio newborn photographer? I would love to be yours! Please stop by the investment guide to explore your options and schedule your appointment. Feel free to contact me with any questions, I am always happy to help!